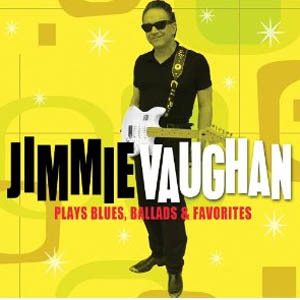 The last time Jimmie Vaughan released a solo album, Barack Obama was a little-known state senator from Illinois and the dot-com bubble had just burst. Though much has changed over the past nine years, the blues remains the same. In 2010, Vaughan is unfashionably fashionable as ever, but something is lacking in these 13 songs—urgency, perhaps? It certainly doesn’t bode well that this comeback album is a collection of covers. Blues, Ballads, and Favorites is full of lean, brassy selections that focus on taut, swinging grooves, wiry riffs and grunting baritone sax, but the album yields few surprises. Although Vaughan translates Willie Nelson’s “Funny How Time Slips Away” into a soul ballad, and turns over lead vocals to old friend Lou Ann Barton on Little Richard’s “Send Me Some Lovin’,” the album runs out of momentum about halfway through. It’s an obvious labor of love for a man who has decoded the DNA of the blues strand by strand, but still not worth the near-decade wait.